Smartphones are everywhere. Approximately 20% of the world’s population (roughly 1.5 billion) own one; a percentage on par with the number of people who own a personal computer. As one can imagine, this makes the mobile app market a very lucrative business opportunity. However, app developers are still struggling to monetize their applications in a manner that allows them to make a lot of money without alienating a large percentage of their user base. Of course, there are many strategies and schools of thought regarding monetization. The age old model of employing a dual pronged approach by offering a free app with a paid version has proven to be successful for some – but not for all. Advertising has made some game developers like Rovio (Angry Birds) a lot of money. Now, in app purchases are taking hold and are proving to be more lucrative than any prior method. The problem revolves around finding that delicate balance between offering in app purchases and not making consumers angry. The problem revolves around finding that delicate balance between offering in app purchases and not making consumers angry. Though, it appears that Japanese app development firms have cracked that code. Over the last year, their mobile app market has literally exploded with success. So much so in fact, that Japan is now the biggest app market in the world. Applications there are being downloaded by the millions and the apps themselves are highly rated. So, the question is simply this: how did they do it? Before we go off the deep end, let us take a look at some stats surrounding the Japanese smartphone and app market so we can see what’s going on. In October 2013, Japan surpassed the United States to become the market with the highest app revenue. That’s for iOS and Android combined. Japan’s smartphone penetration increased from 28% to 42% in 2013. Their population is 127 million which means ~17.78 million more people are now using smartphones in Japan than last year. That percentage is expected to grow from 42% to 62% in 2014 which will be a faster smartphone adoption rate than pretty much everyone else. The mobile space in Japan was already quite successful. From 2009 to 2012, the mobile market went from approx $4.9 billion to $8.2 billion. Most of which was digital content purchased on feature phones. Smartphones didn’t make their first meaningful dent until 2011 and 2012. Games downloaded on iOS devices in Japan make three times the global average and games downloaded on Android devices make six times the global average. 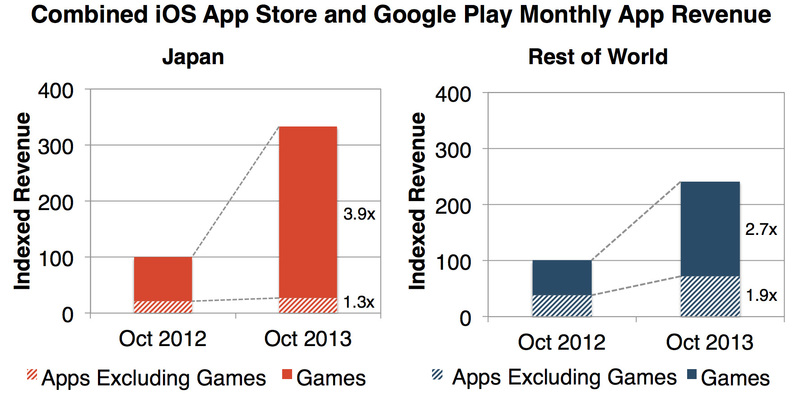 Japan is the only country where Google Play Store revenue has caught up to iOS app revenue. That’s how explosive the growth has been. Game growth in Japan is outpacing everywhere else in the world. There are 3.9 times as many games now than there were in 2012 for Japanese consumers, compared to 2.7 times as many for everyone else. The big app and game developers in Japan outspend the competition in terms of advertising. The most important stat. Games downloaded on iOS devices in Japan make three times the global average and games downloaded on Android devices make six times the global average. You can find the source for all these stats here. Developers have tweaked the beginning tutorial in Rage of Bahamut to make it more appealing for new gamers. First and foremost, some of the success can be attributed to the growth in smartphones. As stated above, the smartphone market grew 14% from 2012 and that has no doubt helped bolster sales of applications in the smartphone app market. It also helps that people were spending hundreds per month on their feature phones already for digital content. When they switched to a smartphone, they just started spending hundreds per month on their smartphone instead of their feature phone which would account for feature phones making less and smartphones making more. There have been other, smaller factors in the adoption of smartphones in Japan, and in the creation of thriving mobile ecosystems to boot. Google worked to establish carrier billing in early 2011 in Japan, making it very easy for consumers to get paid apps. This allowed people to purchase apps and simply pay for them later on their phone bill. The added convenience definitely helps. Last is the adoption of the app market for developers. There are simply more games and content to buy than ever before. As the numbers go, there are nearly four times as many games for Android and iOS in Japan than there were last year. This has saturated the app market with plenty of nice things to purchase and outpaces the rest of the world by quite a large margin. The hit game Puzzles and Dragons earned $4.1 million per day during October 2013. It has a paltry 1 million downloads outside of Japan. The biggest stat to pay attention to is how much more the big developers in Japan have grown. In October 2012, the top five publishers were making about $500 million per month. By October 2013, that increased to about $3.9 billion per month. That’s a very dramatic increase. The key lies in the statistic that mobile games on iOS devices in Japan make three times the global average and the astonishing fact that Android games make six times the global average. Simply put, Japanese developers are getting a lot more money out of their apps per download than anywhere else in the world. The reason why this is so is because of an unprecedented habit of adapting to consumer trends. Pretty much all of the biggest players in the Japanese app market use IAPs (in-app purchases). This should be no surprise as the IAP business model is gaining a lot of momentum and developers around the world are doing it. We’ve talked about IAPs before so we won’t go into that rabbit hole right now but we will discuss how Japanese developers are doing it differently and how that’s making all the difference. Instead of focusing on getting people to download the apps and games, developers instead focus on what happens after the download. They believe that if people play their games long enough, they will eventually buy something. Thus, Japanese developers have become exceptionally adept at finding where people stop liking their game and then fixing it so that people like the game again. This translates to a superior gaming experience that actually makes people want to spend money. Developers also focus on making the games difficult without being too difficult. Hironori Tomobe, who has a Ph.D. in computer science and works for DeNA, explains it the best. When you combine all of these thought processes into one product, you get a great game that is constantly improved with a targeted, dynamic IAP system. It requires a lot of work and there are many games outside of Japan that use tactics like this. That said, if the world wants to catch up to Japan, a higher quality development cycle and more dynamic IAPs are about the only way they’re going to do it. Japanese firms have been wildly successful, and now the world must wake up to the fact that there is a new undisputed leader in the global app market. The immense growth of these firms has led many of them to draft further plans for global expansion. It’s possible that we will see mergers, strategic partnerships, and the like as things get more competitive in this space. There have already been examples of this as Supercell (developer of Clash of Clans) recently sold half of their company to Softbank/GungHo Entertainment and experts expect more to happen. We’d like to know what you think. IAPs are a thing of contention among consumers but people in Japan don’t seem to have the same problems with IAPs that the rest of the world does. Do you think it’s possible to find an IAP system that people actually like? Let us know in the comments!